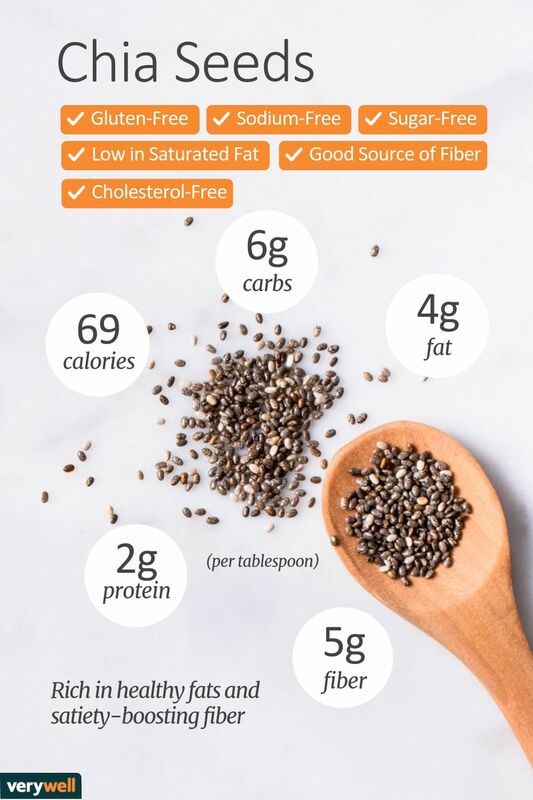 Even though chia seeds were virtually unknown in the US twenty years ago, this trendy superfood is now on shelves in every grocery and health food store. But are chia seeds really healthy? The tiny black or white seeds from the Salvia hispanica plant do provide a boost of nutritional value in the form of fiber and omega-3 fatty acids when you add them to salads, yogurt, or smoothies. But the research behind these seeds may not fully live up to the hype. There are two different types of carbohydrates in chia seeds. You'll benefit from 5 grams of fiber when you consume a single serving of these seeds. Fiber not only helps to boost digestive health, but fiber also helps to regulate blood cholesterol and boosts satiety—the feeling of fullness after eating. The remaining gram of carbohydrate in chia seeds is starch. Starch is a good source of energy for the body. There are no sugars in chia seeds, although the food is often added to foods that contain added sugars, such as flavored yogurt. The estimated glycemic index of chia seeds is 1 and the glycemic load of the food is the same. As a reference, foods with a GI of 55 or below are considered low glycemic foods. The fat in chia seeds is primarily polyunsaturated fat, which is considered to be a "good" fat. Polyunsaturated fat is liquid at room temperature and may boost heart health when you use it to replace less healthy fat (like saturated fat) in your diet. There are two different kinds of polyunsaturated fatty acids (PUFAs) and chia seeds contain both of them. According to USDA data, you'll get 230 percent (or 2.5 grams) of your daily recommended intake of α-linolenic acid (ALA) omega-3 fatty acids. And you'll get 7 percent (1 gram) of your recommended daily intake of linoleic acid or omega-6 fatty acids. There is no monounsaturated fat in a single serving of chia seeds. You'll also get just under one gram or about 2 percent of your recommended daily intake of saturated fat. Chia seeds are an easy way to add a little bit of protein to your meal. You’ll benefit from 2-3 grams of protein or about 5 percent of your daily target (if you consume a 2000 calorie per day diet) when you consume a single serving of the seeds. It’s also important to note that chia seeds are considered a complete protein. For this reason, many vegans and vegetarians might use chia seeds to boost their protein intake. Complete proteins provide all of the essential amino acids that cannot be made by the body and therefore must be consumed in the diet. However, because chia seeds only provide a small amount of protein per serving, most healthy eaters will need to consume protein from other sources to get their daily allowance. Chia seeds provide vital micronutrients. However, because the serving size is small the nutritional boost you get from consuming the seeds will only put a small dent in your total daily vitamin and mineral needs. However, you will get 17 percent (122 mg) of your daily recommended intake of phosphorus if you consume a tablespoon of chia seeds and you follow a 2000-calorie per day diet. Phosphorus aids in bone development and is important for protein, fat, and carbohydrate utilization in the body. You’ll also benefit from 15 percent (47 mg) of your daily magnesium needs, and 14 percent of your selenium needs. You’ll also get 89 milligrams of calcium or 9 percent of your daily target. If you read mainstream health headlines, you’ve probably been convinced that chia seeds are a nutritional wonder food. While the seeds do provide some health benefits in the form of healthy fat and fiber, not all experts are convinced that the seeds are as beneficial as some sources claim, in part because they are generally consumed in such small amounts. An article published by the American Society for Nutrition notes that while some diet experts point to the weight loss benefits of chia seeds (due to their satiety-boosting fiber content), one important study concluded that ingestion of 50 grams per day of chia seeds for 12 weeks did not influence body mass, composition, or disease risk factors in overweight/obese men and women. The author goes on to point out, however, that another study reported decreased triglyceride levels, serum CRP, and insulin levels in a dietary pattern that included chia seeds. Another large review of chia seed research published in the Journal of Biomedical Biotechnology concluded that while the seeds are probably a healthy choice in your diet, more research still needs to be done to confirm the hypolipidemic effects (cholesterol-lowering effects) of the food. What is the best way to store chia seeds and how long do they last? Store chia seeds in an air-tight container in your pantry or in a dark, cool cupboard. Properly stored, they should last up to 12 months. Chia seeds can be frozen to extend their shelf life. Are there different types of chia seeds or are they all the same? You may find white or black chia seeds in your local grocery store. You may also see a blend of both, but there is no difference in the taste or texture and you use the same storage/preparation/soaking method for each of them. Do chia seeds need to be soaked? No. You can toss unsoaked chia seeds into yogurt or onto salads to provide a crunchy texture to your foods. But you can also soak chia seeds for a softer texture. Blend the seeds with water, juice, nondairy milk or other liquids and the seeds will soften and create a gel-like consistency that many chia eaters prefer. Are edible chia seeds the same as the chia seeds used in the famous Chia Pet toy that was popular in the 1980s? Yes, they are the same seeds. Chia seeds sprout just like seeds from other plants. However, if you have a Chia Pet laying around your house, you should not eat the seeds that came with the toy as they were not approved for human consumption. Chia seeds are easy to toss into a cup of yogurt to provide a crunchy texture and boost of nutrition. They are also easy to throw into a smoothie, however, it's important to remember that when chia seeds are soaked, they create a gel. So if you make a liquidy smoothie in the morning to take with you on-the-go, it may have a thicker gel-like texture by the time you consume it. Also, keep in mind that chia seeds don't lose their nutritional value when ground. So if you dislike the crunchy, seedy texture but you still want to consume the seed, then grind them up and add them to recipes. The best way to grind chia seeds is to use a coffee grinder, but only for a few seconds. Since chia is high in fat, grinding the seeds for longer may result in chia butter (similar to sunflower seed butter or peanut butter). Make sure the seeds are dry before you grind them, since they swell up and get slimy when subjected to water. And if the seeds are attracting a coffee smell from the grinder, try grinding a bit of rice first to cleanse the insides and blade. If you've already tried using chia seeds in yogurt and smoothies, get creative and try these recipes, including chia pudding and chia fresca. According to the American College of Allergy, Asthma, and Immunology, some people who have nut allergies (including peanut allergies) may also be allergic to seeds. So it is important to talk with your healthcare provider to see if you are allergic to chia seeds. In general, however, chia seeds do not produce an allergic reaction. Some people in chia seed research studies reported gastrointestinal discomfort when consuming chia seeds. If you are not used to eating foods with fiber, it is not uncommon to feel some stomach problems when you start to include them in your diet. Chia Seeds. The Nutrition Source. Harvard T. H. Chan School of Public Health.